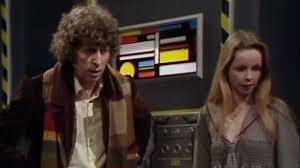 Collision, crisis and Nightmare of Eden (1979) | Randomwhoness: a Doctor Who blog by Johnny Spandrell. Sampling stories in random order. It’s 28 August 1979. Graham Williams, 34 years of age, sits in the gallery of TC6 during the final recording session for Nightmare of Eden. The clock is ticking ever closer to 10pm and he’s got to get this show in the can. He’s recently stepped in as the story’s director, having just had to sack the last one, 63 year old TV veteran Alan Bromly. Bromly didn’t get on with Tom Baker. By all reports, he was not Robinson Crusoe there. Williams himself is not on the best of terms with his leading man. The year had, after all, started with an awkward ‘it’s him or me’ type of meeting in front of Williams’ boss, after which neither man had walked and so here they both are. Trying to get this tale of madmen and Mandrels on time and under budget. It took something pretty serious for Williams to side with Tom over a director. But this was something more than the kind of volcanic strop Tom was renowned for. This was something new, with cast and crew united in mutiny against Bromly. Arguments and insults from the studio floor are regrettable, but can ultimately be worked around. Williams must have thought the only way to get the show finished would be to do it himself. I can imagine Williams sitting in that darkened room, looking at the output of the cameras on the monitors. I wonder if he had time to consider the production in front of him. As he lines up those shots in that horrid yellow spaceship corridor, does he speculate that this could be the cheapest looking story in the series history? With inflation running rampant he was finding it harder and harder to make his budget stretch. This season of stories was showing the strain, from that enormous green weather balloon of an alien to the shabbiest bunch of patched up Daleks that ever graced a quarry. Ah well. At least the Paris stuff looked nice. Perhaps he wonders what went wrong with those Mandrel costumes. The heads look all right, if a little too cute to be monstrous. The main problem is those inflexible forearms, which look like someone has added a length of plumbing pipe to each arm. In fact, that’s probably what happened. If you could shoot them in low light, add a bit of fog, you might get away with it. But the footage already shot has everything drenched in standard bright flat BBC Sci-fi lighting. Every flaw on those Mandrels is unforgivingly apparent, as they waggle those rigid arms in the air. The human characters are having costume issues too. The crew of the Empress have sparkly lame tabards over spandex body suits. Turns out that in the future, space cruiser crew members will dress like first year dance students. The idea seems to be the more sparkly a costume the more spacey it is. Even Taxmen Fisk and Costa, bureaucratic bores, have their black uniforms shooshed up with glittery stripes and natty hats. (Incidentally, what sort of society exists on planet Azure, that when a space collision takes place on their doorstep, they send not police or medicos but tax officers?) And who put Lalla in that dowdy, drab grey number? At least she seems to be getting on well with Tom. What, he may have wondered, is going on with Tryst, played with zeal and an outrageous German accent by Lewis Fiander? Is he trying to out-Tom Tom? Well, good luck to him. Few have tried and even fewer have succeeded. Has he not noticed that everyone else is playing this straight? I like to think that Williams calmly steered his cast and crew through those final scenes, engendering a dogged team spirit to get the work done. Even Tom, I hope, pulled his head in and helped get everything done. Surely a cast must never have empathised with a script as greatly as with Eden’s when Della’s delivers the line: ‘I’m relieved the nightmare’s over.’ Let’s assume Williams got some exhausted votes of thanks as they cleared the studio for the night. A week or so later he turns up for the post session, where he’ll supervise the addition of visual effects. It’s not without its own challenges. A flying insect looks too big and blobby. A gun shot misses Della’s belly where its meant to hit. But it’s on putting together the shots of the colliding spaceships that I imagine Williams sitting up in his seat, suddenly taken by a thought. The story starts with the collision of the two ships, and it transpires that a passenger on one ship is smuggling drugs to the captain of the other. But what’s the link between these two events? Did Tryst and Dymond plan the collision? That would make narrative sense. But the transfer of the Eden projection, drug constituted Mandrels and all, takes place via lasery gizmo between the two ships, with no connection to the collision. It could have been done at any time. In which case the collision was just co-incidental. So either the the collision was caused by the bad guys, but the script forgets to mention it. Or the collision wasn’t caused by the bad guys and was just a credulity straining unlucky break. At this stage, I imagine, Williams drains his coffee, takes two aspirin and heads back to the production office to draft his resignation. LINKS to Day of the Daleks. Both involve two locations linked by a sci-fi magic door, which the Doctor and his companion travel through. And both have big lumbering monsters. NEXT TIME… This isn’t going to be big on dignity. We unleash The Beast Below.